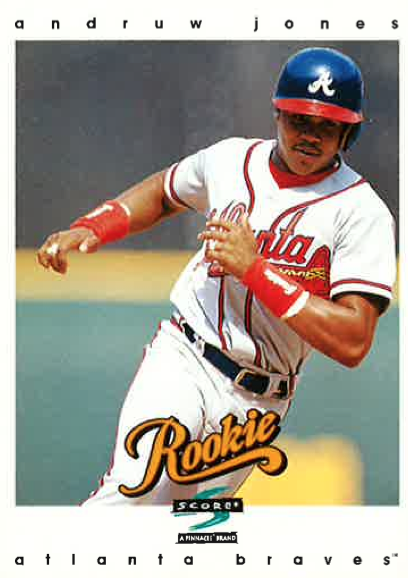 As I mentioned in Part 1 of this series, I ended 2013 by sharing 50 of my favorite pictures from my life in baseball, so I figured it would be appropriate to end the summer by sharing 100 of my favorite baseball cards. 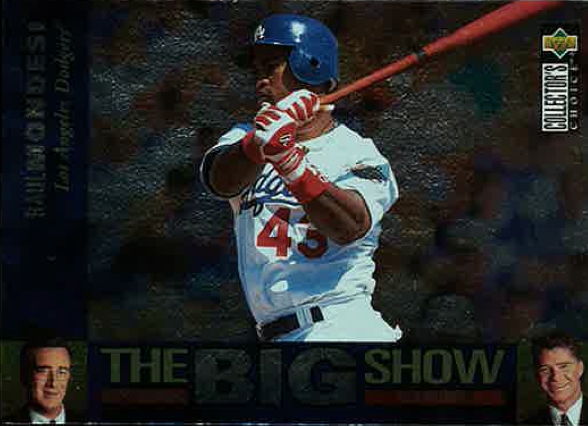 Part 2 features 50 of from the National League. 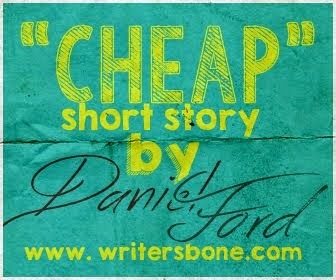 Feel free to share your own favorites in the comments section or tweet me at @danielfford! 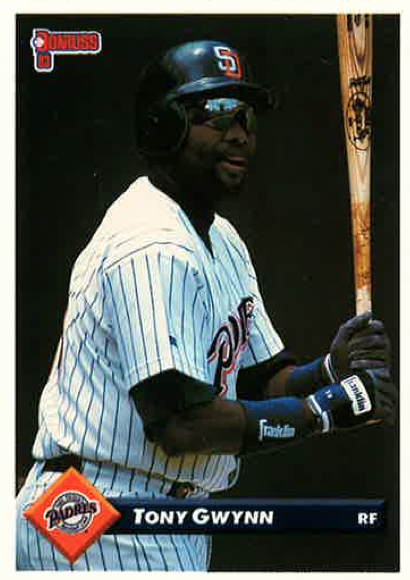 Martinez arguably has one of the greatest nicknames in baseball history: "El Presidente." 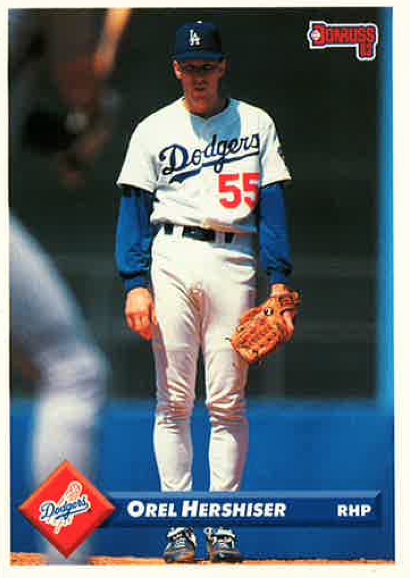 The defining moment of his presidency was his perfect game against the Los Angeles Dodgers on July 28, 1991. Sadly, this is not the last time you’ll see Pedro on this list. 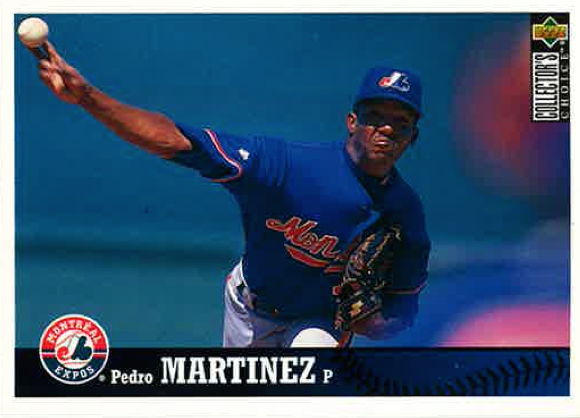 If it weren’t for his time on the Boston Red Sox, Pedro would have been one of my favorite players. 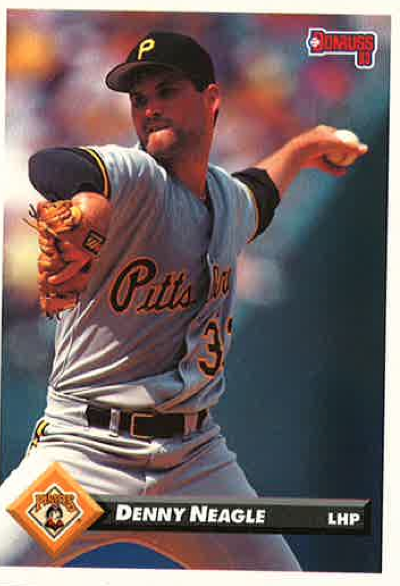 It was hard not to admire what he did on the mound no matter what uniform he was wearing (I’ll never forget him mowing down the National League’s steroid-enhanced behemoths during the All-Star game in 1999 at Fenway Park). 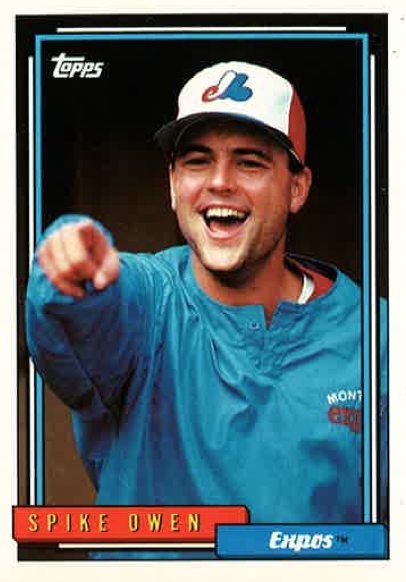 Personally, he looks the best in an Expos jersey. It is my sincere hope that Owen is pointing and laughing at something wholly inappropriate. I’ll remember the 1996 World Series for several reasons. One is seeing my father jump off the couch when Charlies Hayes caught the final out, giving my favorite team its first World Series victory since 1978. The other is getting to stay up past my bedtime to watch Game 1. Jones’ two home runs (as a 19-year-old!) were my first real experiences with a gut-wrenching sports moments. But it was hard to hate him too much because of the mega-watt smile he flashed after each one. 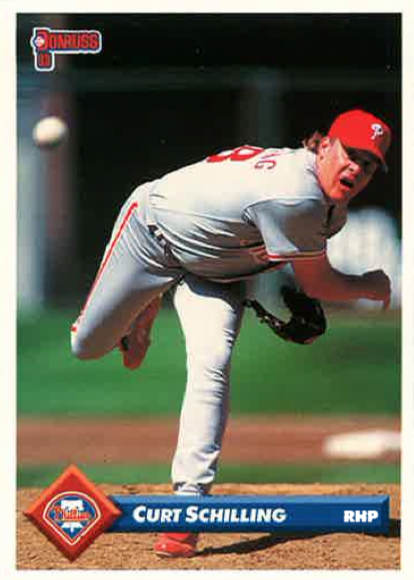 I enjoyed following his subsequent career, even his fat, out-of-shape, paycheck-cashing final years with the Yankees. 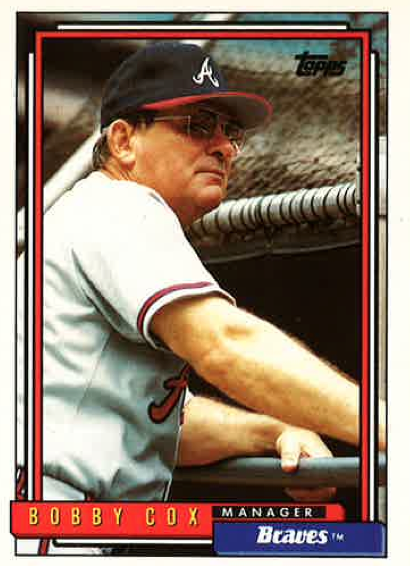 If you were a baseball fan in the 1990s, it was hard not to respect the Atlanta Braves dominance of the decade. 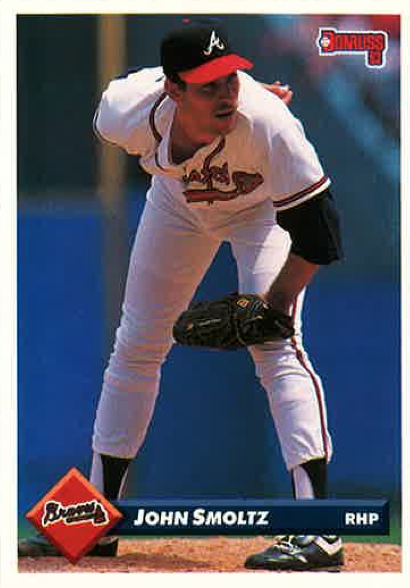 It started with the team’s pitching staff, Glavine, Greg Maddux, and John Smoltz. 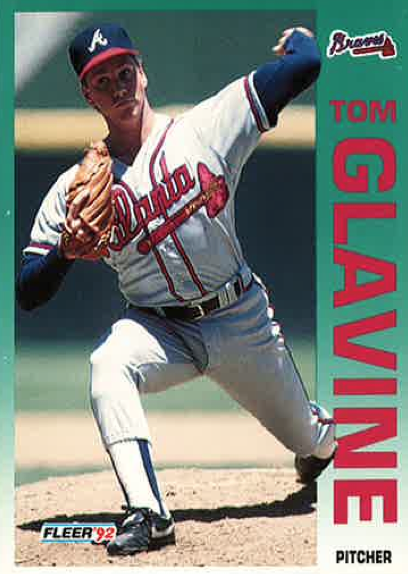 Out of the three, Glavine probably had the best steely look in his eyes while on the mound (although Smoltz does give him a run for the money). 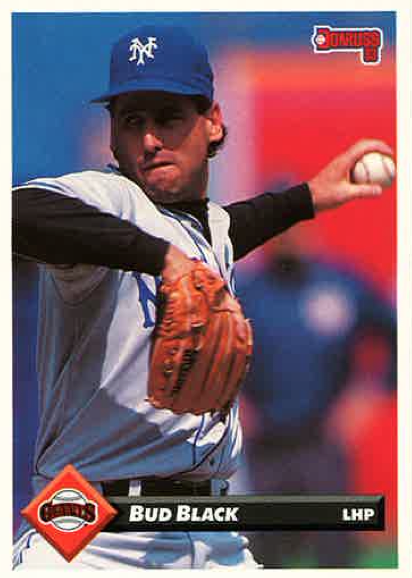 Speaking of Smoltz, I’ll never forget him saying after the 1996 World Series that his Game 5 loss to Andy Pettitte was one of the best games he ever pitched. Because of my earlier bedtime, I was forced to listen to that game on the radio. 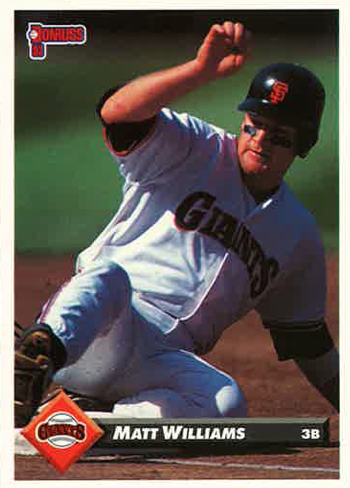 I think I held my breath right up to the moment a gimpy Paul O’Neill tracked down the final out. 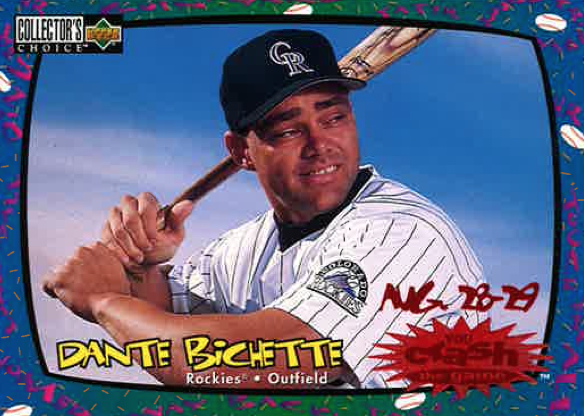 One of the ugliest men to ever play baseball. 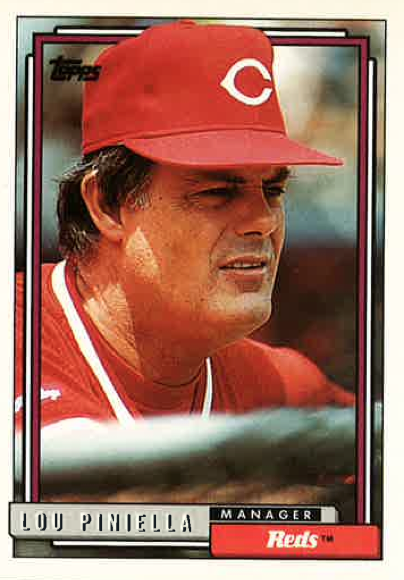 Twenty-nine years as a manager with 2,504 wins kind of says it all doesn’t it? 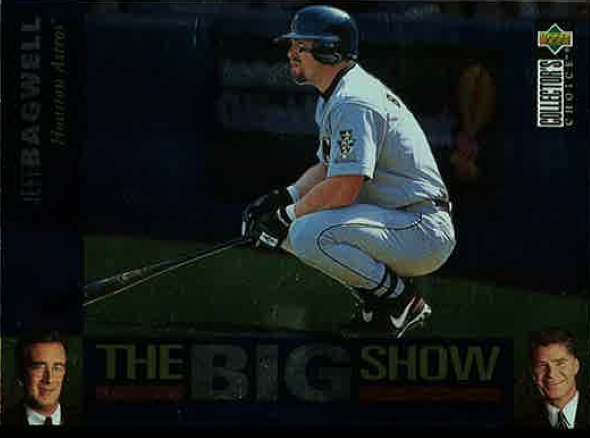 Another one of my “Big Show” cards. 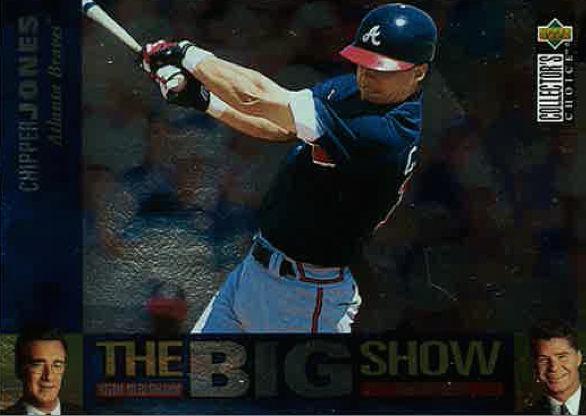 I liked Chipper Jones for two reasons: 1. He tortured the New York Mets; and 2. He wore his socks high earlier in his career. 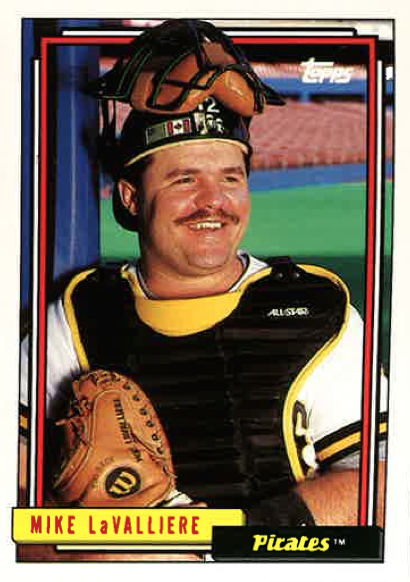 It’s Hardball Heart policy to include any baseball card that features fat, smiling catchers. 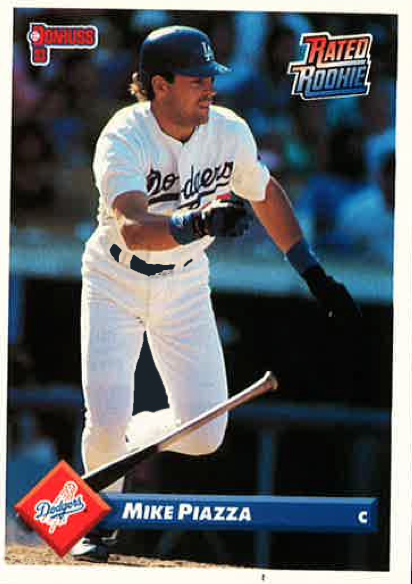 I’m pretty sure that this baseball card is still collecting checks from some Major League team. 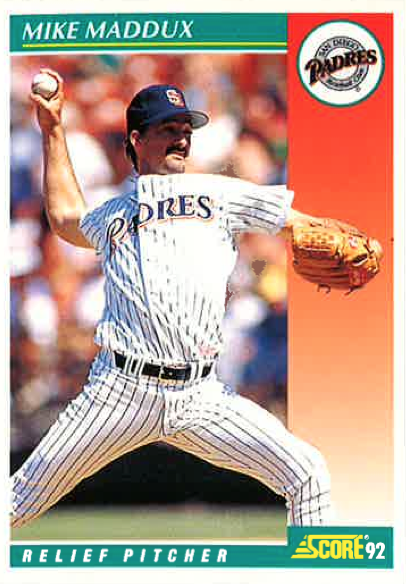 I remember Finley more for his play on the Padres and Angels, but I love these Houston Astros throwback uniforms. 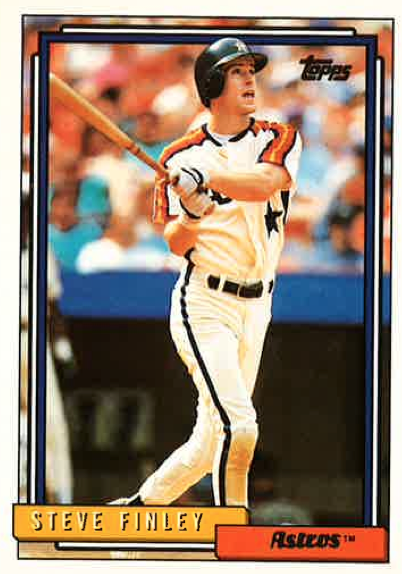 The Astros were big in the 1990s and early 2000s thanks in large part to The Killer B’s (Biggio, Derek Bell, and the upcoming Jeff Bagwell). 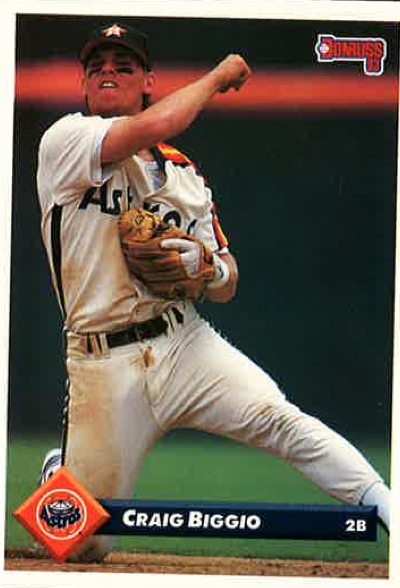 I also have an affinity for Biggio because he played for St. John’s University Baseball coach Ed Blankmeyer at Seton Hall. Put this man in the Hall of Fame. Ridiculous he’s had to wait this long. I could watch him hit a baseball all day. 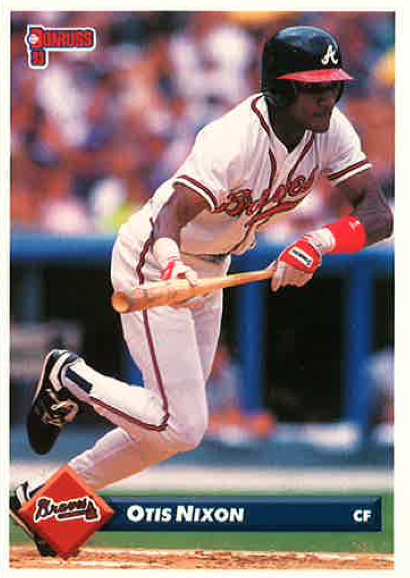 I saw McGriff in person once during one of my trips with St. John’s Baseball (might have been an NCAA tournament game, but I honestly can’t remember). As you might expect, he is a large human being. No one swung with more ferocity than Sheffield. 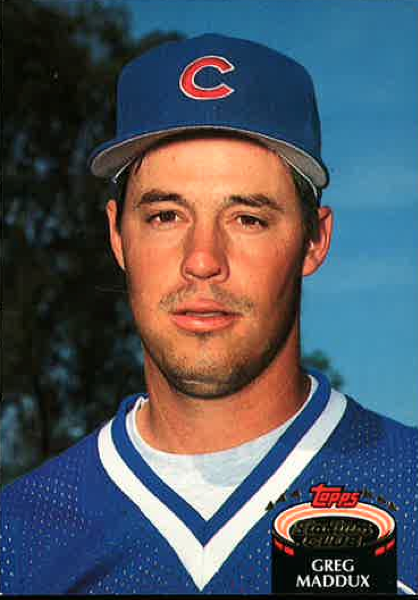 May not have been as good as his brother Greg, but Mike Maddux had a Hall of Fame-caliber mustache. 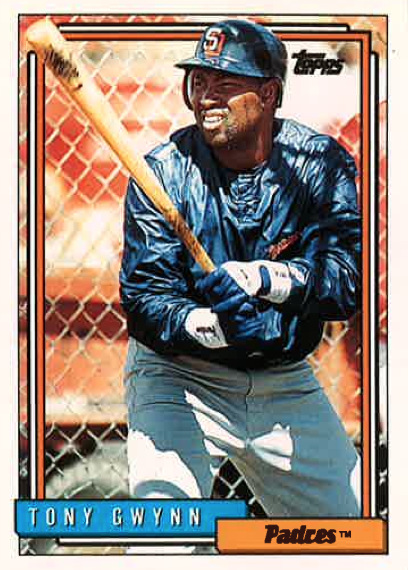 You can never have enough Tony Gwynn baseball cards in my opinion. Gone much, much too soon. 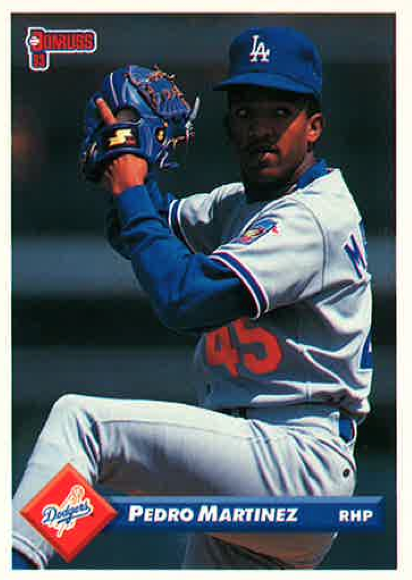 My favorite New York Met. This may be the most important home run in New York baseball history. Pedro looks all wrong in Dodger blue. 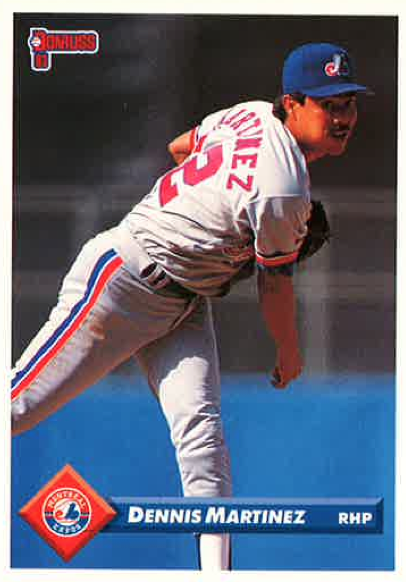 However, he did win 10 games for Los Angeles in 1993 (his second year in the big leagues). He may have looked awkward and gangly, but this guy was a winner. The definition of strength, class, and courage. 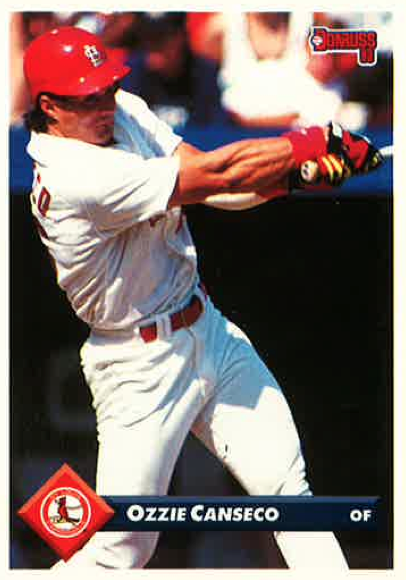 Heh, Ozzie Canseco was a baseball player (but only for 65 at-bats). 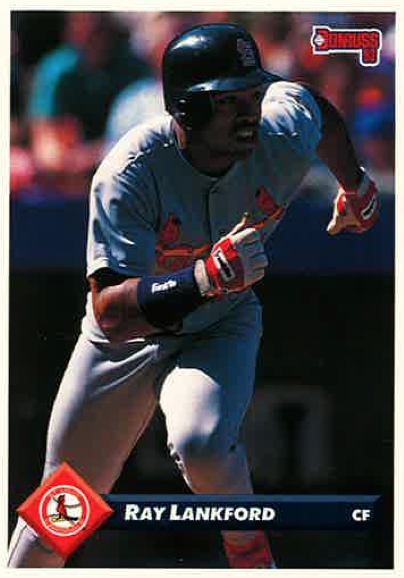 I have three or four cards of Ray Lankford. I’m not sure why. But here he is. Black is wearing a terrific throwback New York Giants uniform. Pretty sure my mother would still leave my father for present day Righetti. And I think he would understand. 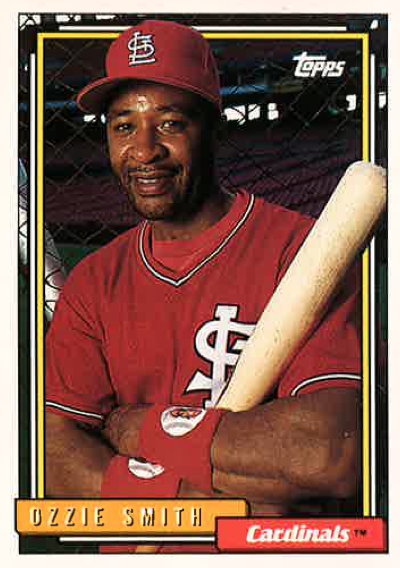 This man may be the most serious guy in the game, but he could hit back in the day and we’re finding out he can manage. 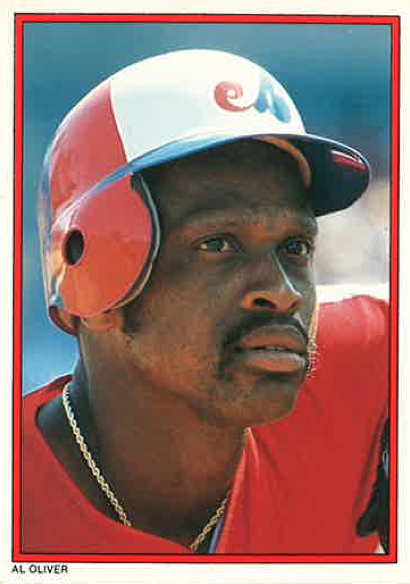 I look forward to see Williams’ scowl lead the Washington Nationals into the playoffs. 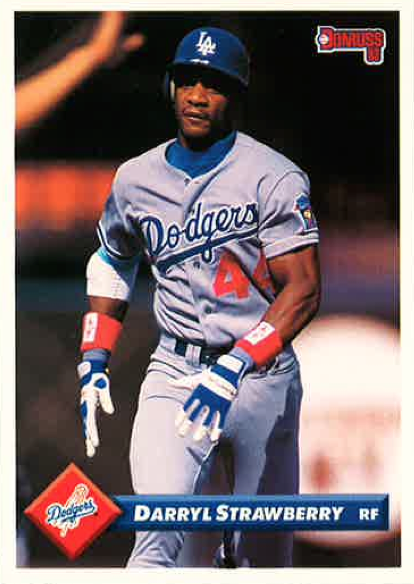 Larkin’s 1995 National League MVP stats are pretty damn good. 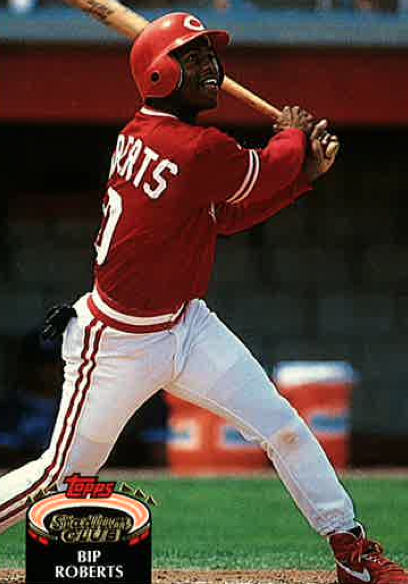 He batted .319, with 158 hits, 51 steals, and only 49 strikeouts. 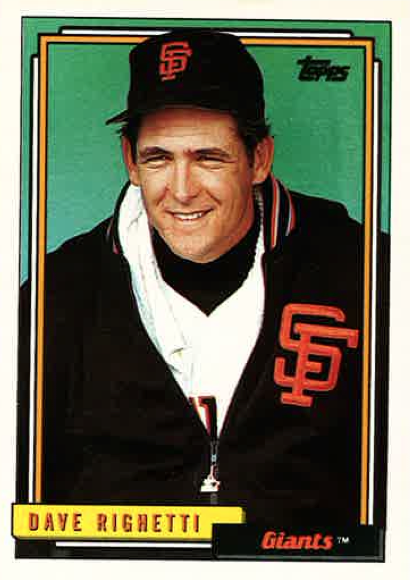 One of my all-time favorite baseball names. 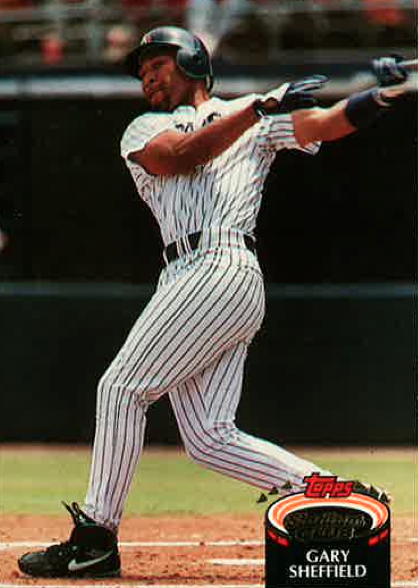 It’s shame I don’t have a card of favorite New York Yankee in pinstripes. I can’t tell you how much I enjoy O’Neill’s commentary in the television booth (which is usually at Michael Kay’s expense). 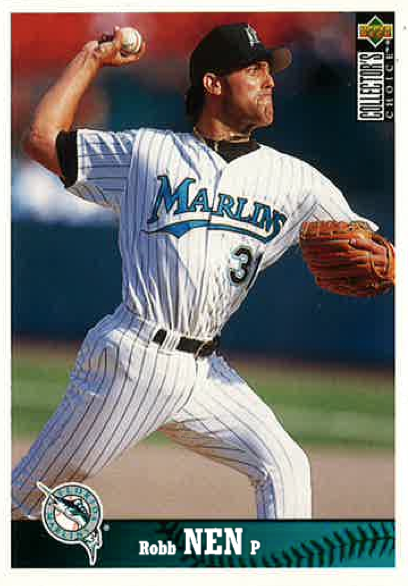 Can’t run a company, but he could sure throw a baseball (2004 still hurts). 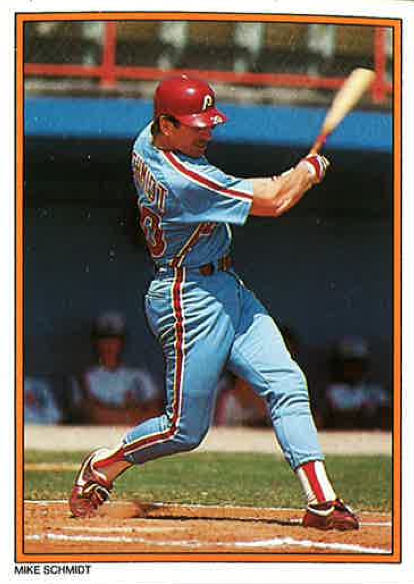 Dark maroon and baby blue shouldn’t work so well on a uniform. But it does and I love it. 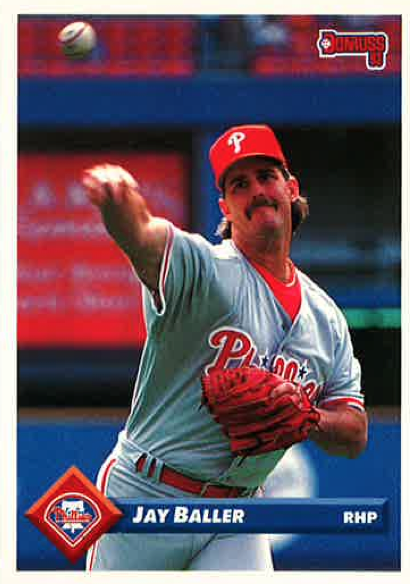 I will refrain from jokes now that Dykstra is out of prison. 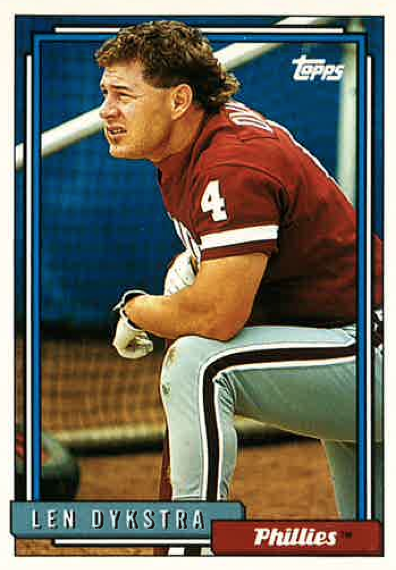 I think it’s a law that anyone with the last name “Baller” has to wear a mullet. 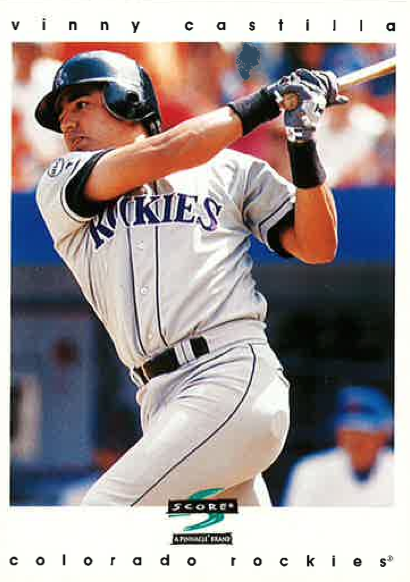 Getting a Colorado Rockies card as a kid was so cool. 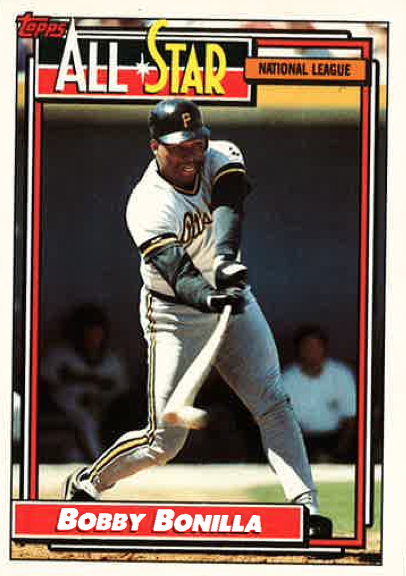 I was a big fan of all their big hitters. What can I say, the early 1990s were a simpler time. 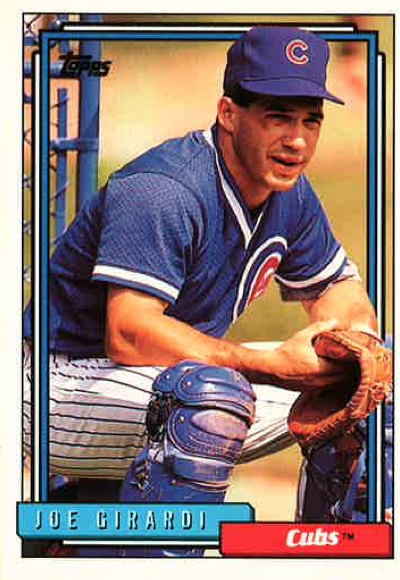 I really liked the way Renteria played the game. 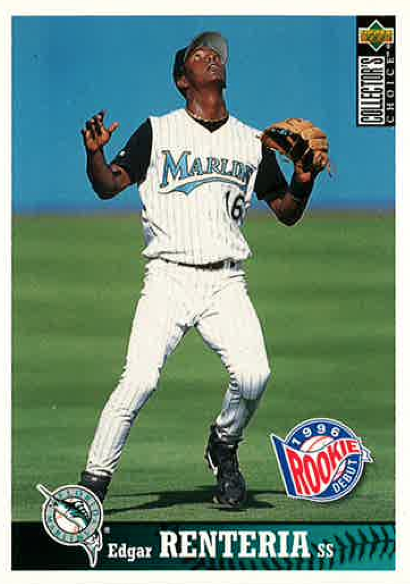 I was an even bigger fan of the Florida Marlins’ past uniform. Nen looks like he is about to throw than baseball through a 18-wheeler. I feel for Girardi after being handed these recent subpar New York Yankees teams. The players play hard for him though and he squeezes every ounce of talent out of them. 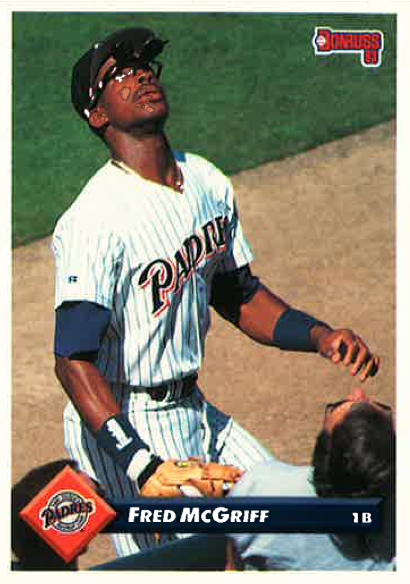 His triple in the 1996 World Series caused my father to hit his head on the ceiling (not really, but he was pretty excited). And I think Joe might be in better shape now than he was in this picture. 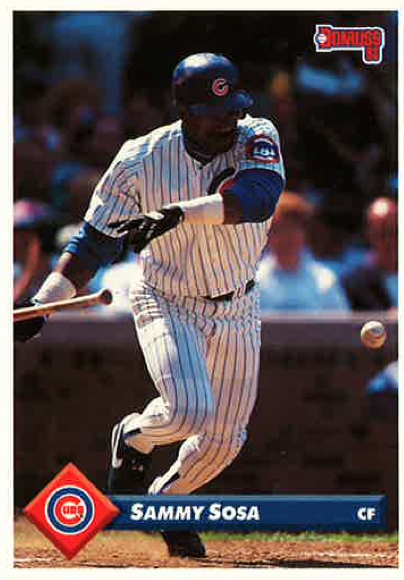 Bet you didn’t think you’d ever see a baseball card featuring Sammy Sosa laying down a bunt, huh? 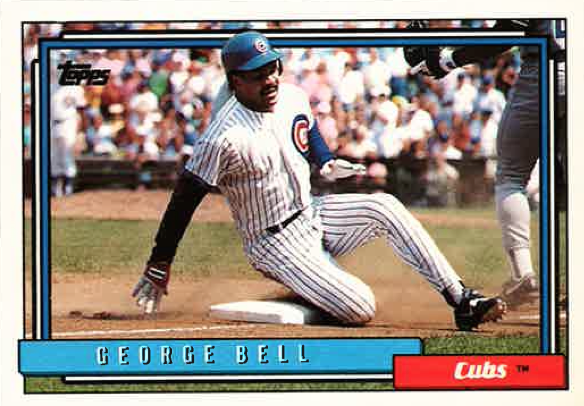 Can you imagine George Bell barreling into you at third base? Me either. Frightening. 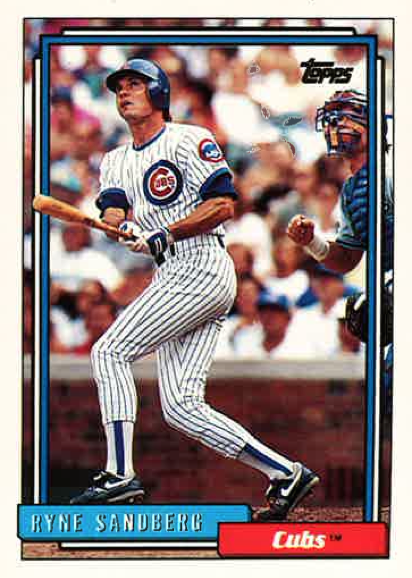 Sandberg made this list because he was the National League MVP the year I was born (1984)! 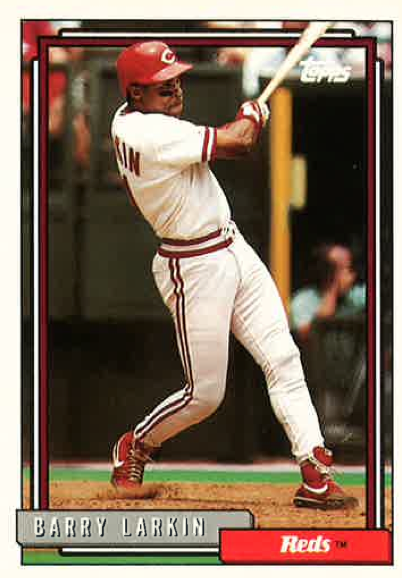 Some highlights: 200 hits, 114 runs, .314 batting average, and 19 triples. Not your best smile Greg. Here are my all favorite baseball player pictures. I think when any baseball sport lover see it and pleased to you. Thanks for share a lovely post. A a lot of or less watch nfl games online free good judgment approach is followed by the moon individuals in their day to day affairs. This helps to stay the harmony and shut bonding of the community that they treasure abundantly. They perpetually act on the principle of closing "What has to be done?" at a specific moment and interact themselves promptly on such tasks instead of stay up for somebody to offer directions. Match play, Stableford, best-ball and different arrangements are simple and fun ... It's completely perfect with both the Rules of Golf and the USGA Handicap System. Golf engages the blockhead in us and the child.& Just how virtuous golf players get to be is demonstrated by their continuous powerlessness to number past five. I found all favourite player in your post . I am pleased to you . 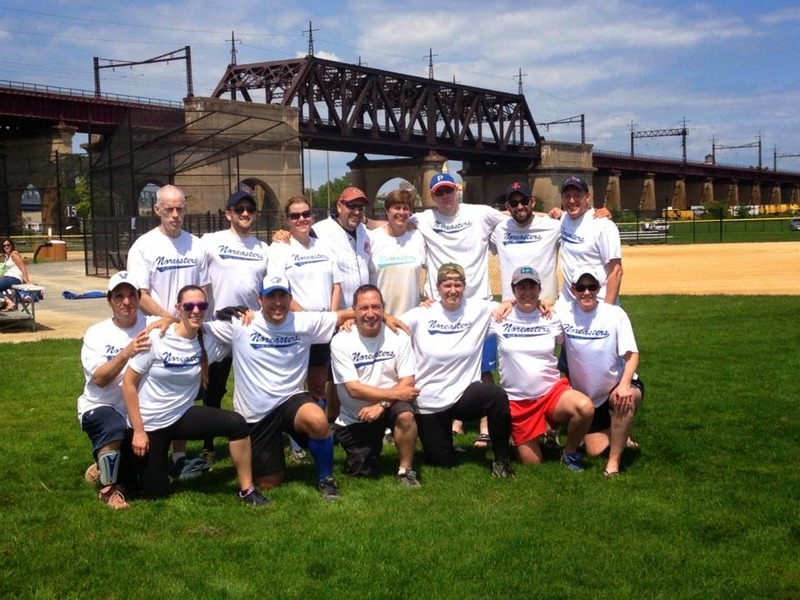 Thanks for sharing such a great post for baseball lovers lıke me . Baseball cards have been well known with grown-ups and kids fascinated with the diversion and the focal point of gatherers since they were first appropriated. These cards were initially created as a promoting vehicle, yet with the ascent in baseball's ubiquity, these exchanging cards have developed into a more significant product. I find a very good website for the party bus , If you want you can visit this site. I love looking at all of the baseball players that I followed when I was a kid! I'll never forget cleaning my bbq grill and watching baseball! 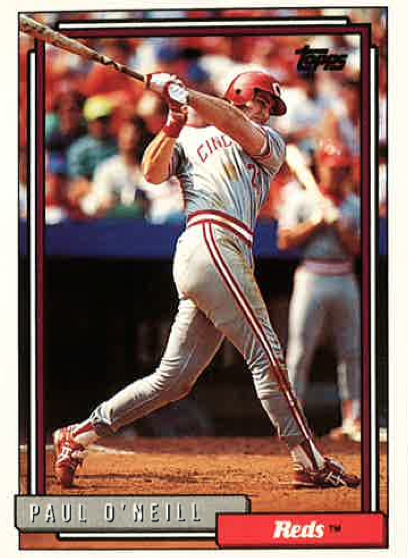 The absolute best baseball cards are likewise the rarest cards that are typically gathered by the students of history and card authorities and they have high esteem. 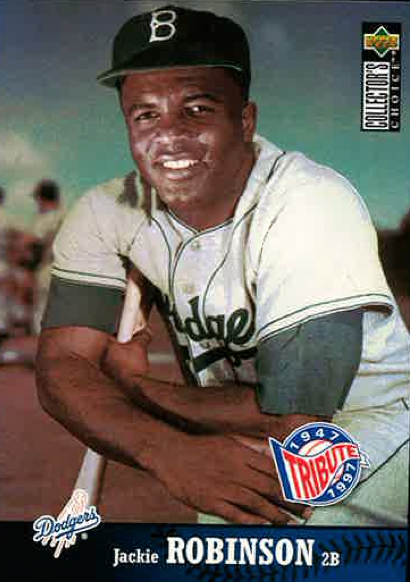 Baseball cards esteem relies upon its release and accessibility. I really like such posts, every post to the end I read.